I have one of the coolest organic companies to feature today: Nourish Organic. I am so excited to share their product line with because Nourish is the 1st USDA-Certified Organic Skincare Collection!!! And besides being USDA-Certified Organic, their products smell AMAZING, WORK AMAZING, and are 100% Chemical-Free!!!!! Nourish Orgainc is clinically proven to moisturize skin with their pure, delightful organic fragrances. They pledge NEVER to use parabens, phthalates, petrochemicals, artificial fragrances or preservatives, silicones, propylene glycol, mineral oils, sulfates, synthetic dyes, triclosan, edta, or aluminum. Discover what it means to never again worry about what you put on your skin. Every nurturing Nourish product contains nutrient-rich organic fruits, vegetables, and plant extracts... and nothing else. I am absolutely LOVING their Almond Vanilla Product line! The Body Wash, Body Lotion, Body Butter, Organic Deodorant & Hand Wash in Almond Vanilla smells AMAZING and works really well too! Indulge your senses and nourish your skin with this Almond Vanilla Signature Set. Feel good about cleansing your skin every day with our 100% organic hydrating Hand Wash and moisturizing Body Wash, and soften even the driest skin with our antioxidant-rich Body Lotion and ultimate-moisturizing Body Butter. They are always 100% chemical-free.The Body Lotion has become my staple after showers and before bed for my dry hands! And I absolutely LOVE that there is now an organic deodorant option! I have never see that before! And not only do I get to enjoy them, but so do my husband and children as they wash their hands multiple times a day with the Hand Wash! I feel great knowing they are washing with organic ingredients that are safe and effective!!! 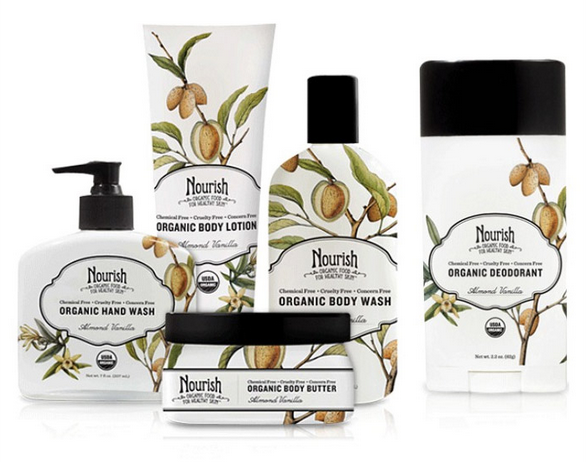 I highly recommend the Nourish Organic line - especially the Almond Vanilla scent! It is so warm, inviting and soothing and is perfect for the upcoming winter! Buy It: You can purchase all Nourish Organic products from the Nourish Organic website.